The First regiment, 3d Brigade, 1st Division of Pennsylvania militia, was organized under act of Assembly of 1858, and belonged exclusively to Philadelphia. Immediately after the first call for troops to serve for three months Colonel Charles P. Dare, in behalf of the regiment, offered its services to the Executive of the Commonwealth, which were at once accepted. Recruiting commenced at the Arsenal, corner of Sixteenth and Filbert, streets, n the fifth of April, 1861 and three days thereafter, the regiment left for active duty, having been mustered into the service of the United States on Sunday, April 21st, by Major 0. F. Ruff, of the U. S. A., as the Twenty-third regiment Pennsylvania volunteers. The officers were all active in recruiting, and received important aid, bolt material and morale, from a committee of citizens. The organization of the regiment was substantially preserved, the officers serving under their militia commissions. Colonel Charles P. Dare, Lieutenant Colonel David B. Birney, and Adjutant Casper S. Gillingham remained in the positions which they had ir several years held. George C. Spear was elected Major on the 16th of April, from Captain of company A.
Th regiment had no camp of rendezvous, having been ordered into active service on the day of its muster. The officers were all well versed in the school of the soldier, and were able to bring their men at once under discipline, and to impart t them skill in the practice of arms. It moved on the evening of April 21st, to Perryville, on the Philadelphia, Wilmington, and Baltimore railroad, where Colonel Dare was placed in command of the post, and the regiment was stationed, four companies at Perryville, two at Havre-de-Grace, two at Elkton, one at Bush river, and one at Gunpowder river, with intermediate guards along the road. The post and troops at Elkton were under the command of Major T. W. Sherman U. S. A., afterwards Major General of volunteers, who had been ordered to report with his light battery for duty to Colonel Dare. There were also at Perryville, under Colonel Dare's orders, a fleet of gunboats and transports, together with a marine battery, stationed on the wharves, and served by U. S. seamen. These were under the immediate command of Lieutenants Steadman and Watmough, U. S. N.
On the 28th of May, the regiment was relieved by the Eleventh Pennsylvania, Colonel Jarrett,: and proceeded by rail to Chambersburg, where it was assigned to the 1st Brigade,1 1st Division of Patterson's army. At this place the Adjutant of the regiment, C. S. Gillingham, was ordered to the staff of Colonel Thomas, as Acting Assistant Adjutant General, and so continued to the close of its term of service. From Chambersburg the Brigade marched to Greencastle, where it encamped, remaining about a week, and from thence to Williamsport, where it was employed in guarding the fords of the Potomac. 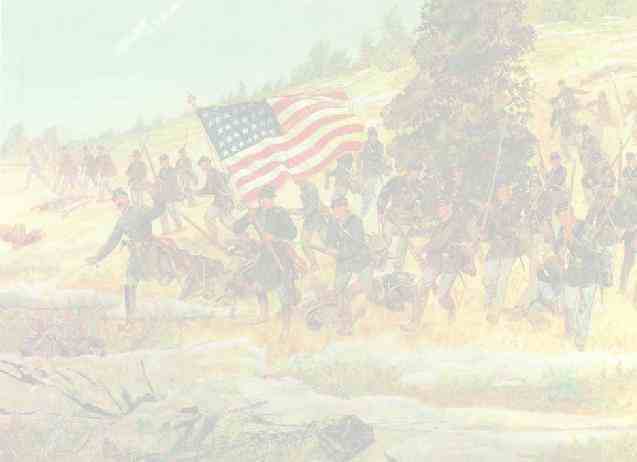 The enemy, at this time, were posted at Harper's Ferry, under command of General Joseph E. Johnston. When he perceived that General Patterson's army, which had been organized at Chambersburg, was about to cross the Potomac, he evacuated that post and retreated to Bunker Hill. On the 17th of June, Colonel Thomas' Brigade crossed the river, and advanced to Falling Waters in pursuit of the enemy, Cadwalader's entire Division being ordered to follow. At this juncture the regular cavalry and all the artillery, together with Colonel Thomas, were, by the command of General Scott, 2 ordered away, and re-crossed the river, leaving the three regiments and City Troop under command of Colonel Dare, with orders to follow the next day. At daylight the retreat commenced, with a large body of rebel cavalry hanging on the flanks and rear, but re-crossed the river without an engagement, and encamped on the old ground at Williamsport. Two days later, the cavalry and artillery which had been ordered away returned, and Colonel Thomas again assumed command of the Brigade. The Twenty-third remained at Williamsport until the 2d of July, when it again crossed the Potomac, with the entire army of General Patterson. Advancing to Falling Waters fire was opened upon the head of the column by a body of rebels concealed in a wheat field and wood. During the skirmish which ensued, the Twenty-third supported Captain Perkins' battery, and although some few were killed and wounded in other regiments, it had no causalities. Advancing on the following day to Martinsburg, four companies were selected for provost duty, Major Spear, by order of Colonel Thomas, assuming command in the town. On the 4th of July, at twelve o'clock P.M., the troops of the Brigade were drawn up on dress parade, while Captain Perkins' battery fired a salute, the regimental bands playing National airs. The column again advanced to Bunker Hill, where the Twenty-third was sent out on three occasions, in conjunction with the cavalry, for reconnaissance. On the 17th of June, the entire column moved to Charlestown, and encamped around the town, when the provost guard was again taken from the Twenty-third. Its term of service having expired, it was ordered to Philadelphia, where it arrived on the 29th of July, and on the 31st was mustered out of service. The discipline and soldierly conduct of the regiment throughout its entire term was excellent, receiving the commendation of the commanding General. Nearly the entire regiment re-enlisted for three years, and was permitted to retain its old number, the Twenty-third Pennsylvania volunteers. History & Rosters: History of the Twenty-Third Pennsylvania Volunteer Infantry. Birney's Zouaves. 3 Months and 3 Years service. Civil War 1861--1865. Compiled by the Secretary by Order of the Survivors Association Twenty-Third Regiment Pennsylvania Volunteers. 1903-1904.